Tyrone eased in the last 12 of the All-Ireland Football Championship as they had far too much class for a naive Tipperary team at Semple Stadium. The Red Hands moved 0-4 to 0-1 up in the first-half but Tipp fought back to level and there was only a point in it at the break as Tyrone led 0-7 to 0-6. However, Tyrone hit nine unanswered points after the break as Tipp continued to concede turnovers. Peter Harte, Mattie Donnelly and Connor McAliskey were among Tyrone's stars. But Mickey Harte will have been delighted with his team's performance all over the park as the Red Hands recovered from a brief period of concern in the first half to run out conclusive winners. With Tipp attacks breaking down time after time amid Tyrone's defensive blacket, the Red Hands were able to break at pace into opposition territory throughout the contest. In the first half, the home side did have plenty of possession but Tyrone always looked to have the greater attacking threat. A superb Sean Cavanagh point helped the Red Hands lead 0-3 to 0-0 but Tipp hit four of the next five scores to draw level as their attackers briefly began to escape Tyrone's defensive stranglehold. A magnificent Peter Harte point started a run of three straight Tyrone scores but Kevin O'Halloran's third excellent free of the opening half helped cut the margin to the minimum by the interval. 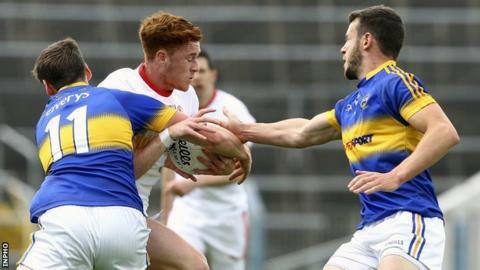 Tempers flared late in the first half as Tyrone duo Cathal McCarron and Joe McMahon were booked along with Tipperary's Steven O'Brien and Peter Acheson following a dust-up. After being second best for most of the first half, Tipp must have been content enough to only be a point down at the break but their challenge totally imploded after the break. A fine score from the impressive McAliskey and a Darren McCurry point quickly extended Tyrone's lead to three after the restart. Another McCurry free was quickly followed by another McAliskey score after Tipperary conceded possession yet again after Brian Fox had been blown for over-carrying. As Tipp lost their discipline in the closing stages, substitute Liam Casey were sent off for a nasty stamp on Colm Cavanagh on 56 minutes only moments after he had been introduced. At that stage, Tyrone were 0-13 to 0-6 ahead and helped by the extra man, they were able to tag on six more points with Tipp's only second-half score a 67th-minute free from O'Halloran.